Many Frederick County households worry every day that they are one emergency away from financial disaster. These households are known as ALICE (Asset, Limited, Income Constrained, Employed). 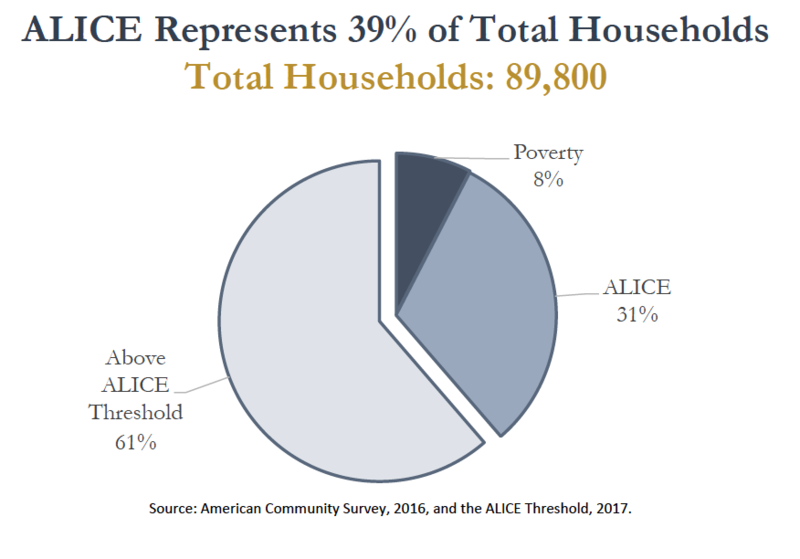 ALICE families have income above the Federal Poverty Line, but not enough to afford a basic household budget that includes housing, child care, food, transportation and health care. 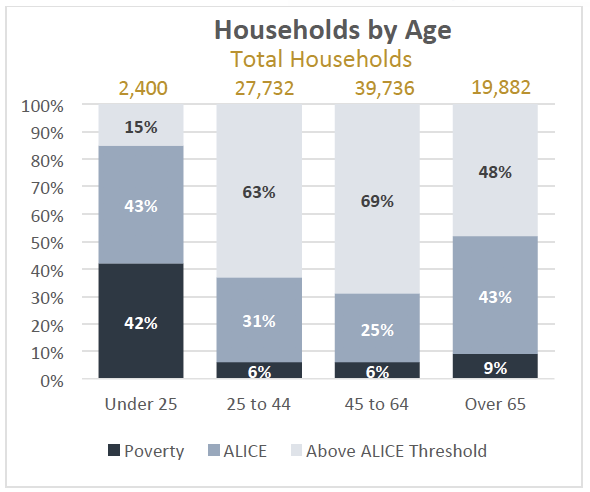 ALICE households live in every community in Frederick County -- downtown City of Frederick, Urbana, Brunswick, Emmitsburg, in cities, farmlands and mountains -- and include women and men, young and old, and all races and ethnicities. The information below is a sampling of information that demonstrates the challenges in specific communities throughout Frederick County. For the full Maryland report and additional information on ALICE click here. Source: American Community Survey, 2016, and ALICE Threshold, 2016. Note: Race/Ethnicity is self-reported data. Typically, this data experiences a reduced level of households reporting. 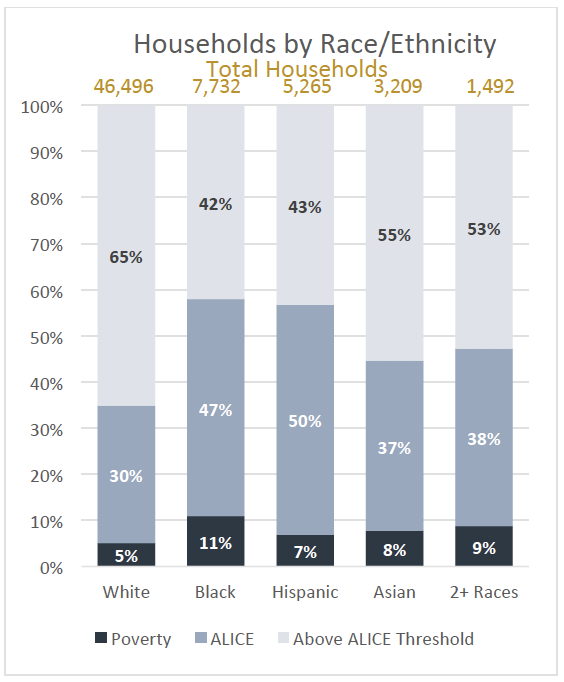 However, 64,194 households (71.5%) self-reported race/ethnicity data. Data in all categories except Two or More Races is for one race alone. Because race and ethnicity are overlapping categories, the totals for each income category do add to 100 percent exactly. 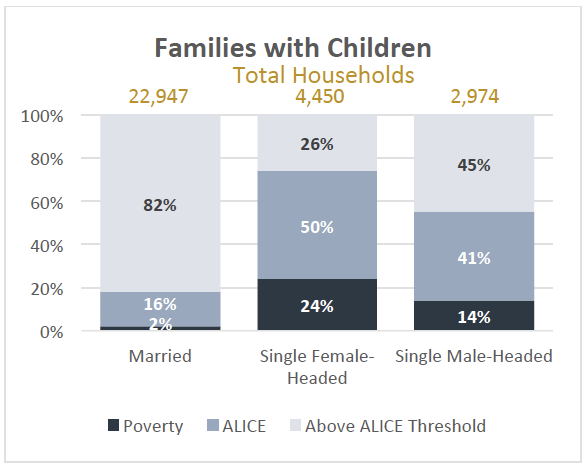 In what Frederick County municipalities are ALICE households found? ALICE Households are found in every city and town in Frederick County. However, the data indicate that ALICE households are concentrated in rural communities and the City of Frederick. *Note: Municipal level data on this is 5-year averages for Incorporate Places. Totals will not match county-level numbers because some places cross county borders, data is not available for the smallest places, and county-level data is often 1-year estimates. The Household Survival Budget does not allow for any savings, leaving a household vulnerable to unexpected expenses. Affording only a very modest living in each community, this budget is still significantly more than the 2016 U.S. poverty rate of $11,880 for a single adult and $24,300 for a family of four. 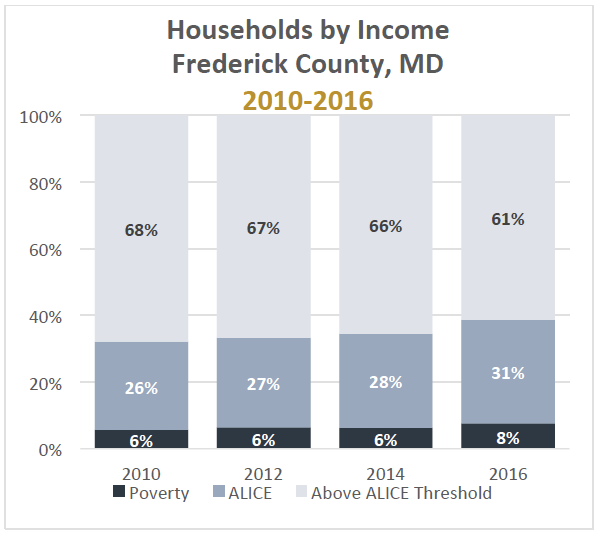 Click here to view a PDF of the ALICE Report for Frederick County including the Household Survival Budget. Click here to view the Household Survival Budget and the Household Stability Budget for each county in Maryland. What is United Way of Frederick County doing to help? The report underscores United Way of Frederick County's mission of bringing people and institutions together to collectively build a strong, viable community. UWFC focuses on strengthening the education, financial stability, and health of the Frederick County community because we know that children do better in school and in life when they have access to quality education; people are more financially secure when they have the skill set to land and keep good jobs, and have access to affordable, quality health care. Through program and grants, United Way of Frederick County yields nearly $3 million annually in community impact that helps children, adults and families thrive. Whether it's through the Prosperity Savings Accounts program, free tax preparation, budget coaching, or financial education, the Prosperity Center helps families and individuals obtain the knowledge and resources they need to achieve financial stability. UWFC also collaborates with business, government and community groups to identify and advocate for solutions that address underlying issues that negatively impact the Frederick County community, and especially ALICE families. Want to learn more about the faces of ALICE? 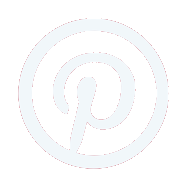 Visit our new ALICE in Promiseland Blog by clicking here. Click here for a list of community resources and programs that could be of help to you or someone you know. Click to watch Malcolm Furgol, director of community impact, speak about the ALICE Report with Jordan Lindsay of WHAG. Click to read this article about the ALICE Report and the Prosperity Center. This piece, authored by Nancy Lavin, was featured on the front page of the January 14th issue of The Frederick News-Post. Click to read this article about the scarcity of public transportation and how this translates to ACEs' impact on county residents. This piece, authored by Nancy Lavin, was posted on August 26th on The Frederick News-Post website. Click to read this article about the successful food bank program run by Frederick Rescue Mission. This piece, authored by Nancy Lavin, debuted on August 23rd on The Frederick News-Post website. Click to read this article about the success of United Way's nonprofit collaboration The Unity Campaign. This piece, authored by Nancy Lavin, debuted on August 23rd on The Frederick News-Post website. Click to read this article about the Faces of ALICE. This piece, authored by Nancy Lavin, debuted on September 23rd on The Frederick News-Post website. Click to read this article about how local social service agencies, including United Way and Unity Campaign partners, help struggling families. This piece, authored by Nancy Lavin, debuted on September 23rd on The Frederick News-Post website. Click to read this article comparing Frederick County to the general population using the US census. This piece, authored by Nancy Lavin, debuted on September 23rd on The Frederick News-Post website.  Click to read this article reviewing United Way's recent ALICE candidate forum. This piece, authored by Nancy Lavin, debuted on October 12th on The Frederick News-Post website. Click to watch Malcolm Furgol speak about the ALICE Report on this Comcast Newsmakers segment. Click to read about how the ALICE report can be used outside of Frederick.  The media webinar took place on Wednesday, September 12 2018 at 10 am. Click here to view the recording.